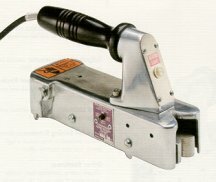 Our Continuous Hand Rotary sealer is designed for convenient, versatile sealing of bulky and unique packages. It was developed in response to some of the unusual sealing problems encountered by military, government and overseas packagers. Airtight seal which meets MIL Specs, and is currently in use by military packagers throughout the world. With the Hand Rotary Sealer, an operator can seal over splices and thick overlaps with no problem. Materials commonly sealed include heavy laminates, foils and MIL Spec materials, as well as cellophane when used with overlap labels. On lighter materials, a sealing speed of up to 400 inches per minute can be achieved. Model F, Flat Seal. Many sealing applications require only a standard, flat, one-inch seal as delivered by the Model F Hand Rotary Sealer. If a grooved seal is required, an optional conversion kit is available to change a Model F into a Model G.
Model G, Grooved Seal. Where large enclosures are being fabricated, or where spliced material is being used, double-beaded "grooved" rolls can be furnished . 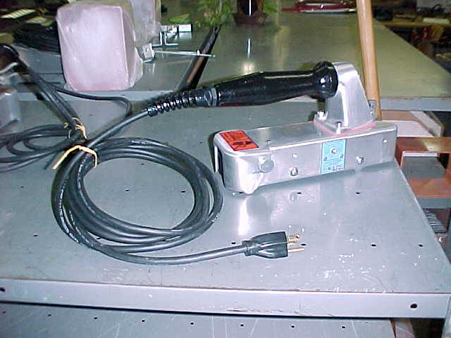 On the Model G Sealer, one of the pre-heated bars is spring-loaded to bring both bars into contact with the material. This provides more heat and softening of fold-over material to improve seal strength and make tight seals over splices and overlaps.